7/3/2008 – In October there is one between Anand and Kramnik in Bonn. But that will be peaceful compared to the World Championship that is scheduled in Berlin this weekend. There four minutes of chess are interspersed with three minutes of violent pugilistic activities. We bring you photos and videos – and we also found out what FIDE President Kirsan Ilyumzhinov thinks about this sport. Chessboxing World Champion Frank Stoldt defends his title as slumbering Russia awakes! David “Double D” Depto and “Anti Terror” Frank Stoldt will meet for the World Championship in Chessboxing. Six rounds of speed chess and five rounds of boxing will take place alternatingly. In a maximum of eleven rounds, the decision will come either through K.O. or check mate. The match takes place on November 3rd 2007 in Berlin, Germany. Press release. On Saturday, July 5th, 2008, a nationwide chessboxing tournament 2008/2009 throughout Germany (Hamburg, Cologne, Munich) will be inaugurated in Berlin. The tournament features an Open German Championship in the middleweight division and a World Championship tournament in the light heavyweight division. Totally unrivalled in its division is the top-class entertainment program with surprising musical guests. The evening will climax with the fight Frank Stoldt vs. Nikolay Sazhin. Frank Stoldt won the first light heavyweight world championship title in chess boxing after defeating American David Depto (San Francisco) on 9 November 2007 in a dramatic fight. This time he defends his title against 19 year-old Russian Nikolay Sazhin. From Krasnojarsk in Siberia, Nikolay Sazhin is 1.83 tall, weighs 85 kg and has shown his talent in more than 60 boxing matches (49/13/0). After seven years at his chess club “Ladia”, Nikolay has reached an Elo-rating of 1911 and is considered to be Russia’s most promising chessboxing talent. The coming chessboxing superpower Russia has woken up with a roar! Being a traditional chess nation and having conquered the world of boxing during the last 20 years, Russia now seeks to prove that the world’s strongest chessboxers come from Russia, too. “Anti Terror“ Frank Stoldt is a 37-year old riot policeman from Berlin, he weighs 84.5 kg (13,3 st.) and is 1.87 tall. He is a former Berlin Kickboxing Champion and furthermore has 25 boxing bouts behind him. In 2005 he began chessboxing and has since then won every fight. His ELO-rating is 1960. In his capacity as a policeman he went to Kosovo on behalf of the United Nations to train policemen there. Will experienced Frank Stoldt be able to keep the title in Berlin or will he loose it to the upcoming chessboxing star Nikolay Sazhin? There are only a few tickets left for seats in the second row, and seats in the first row are totally sold out. 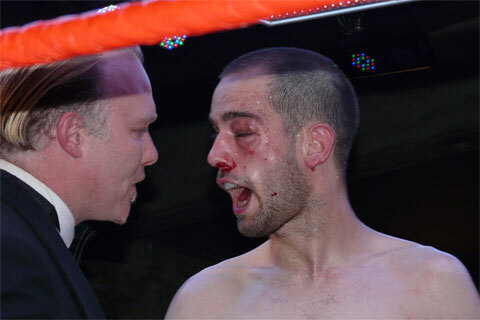 On November 3rd 2007 your intrepid ChessBase news team (specifically: Fred 'n Pascal) took the plunge and attended a full chessboxing night in Berlin. In it the German Champion "Anti Terror" Frank Stoldt faced a challenge by America's David “Double D” Depto in a fight for the world light heavyweight title. The event took place Tape, one of the most popular clubs in the city. How many people could be interested in this quixotic hybrid sport? In a sophisticated town like Berlin? The event started at 8 p.m., and when we arrived we saw a line reaching all the way around the club. The audience collects in the hall. We had seats in the third row, in the back are the standing places. The guests in the front row got fizzy drinks with LED ice cubes. The nice lady also gave us some too. Celebrities, like this one here, whom I did not know. But Pascal said he was faaa-mous. The fight was between Marc Breuer from Cologne, 35 years old, 81 kg (178,6 pounds), with an Elo rating of 1972 and Sascha Wandkowski, 28 years old and 79 kg (174,2 pounds), with an Elo rating of 1850. During the chess the contestants wear headphones to shield them from the din of the audience and the commentary by a strong chess player. You probably do not want to see what Marc looked like when the referee finally intervened. Click here at your own risk – but please do not send outraged letters if you do. You were warned. You meet the strangest people at chessboxing events. This is CCGM Arno Nickel, organiser of Freestyle Chess events. Is that chess and wrestling? No, just brutal computer assistance. So what does the FIDE President think about all this?